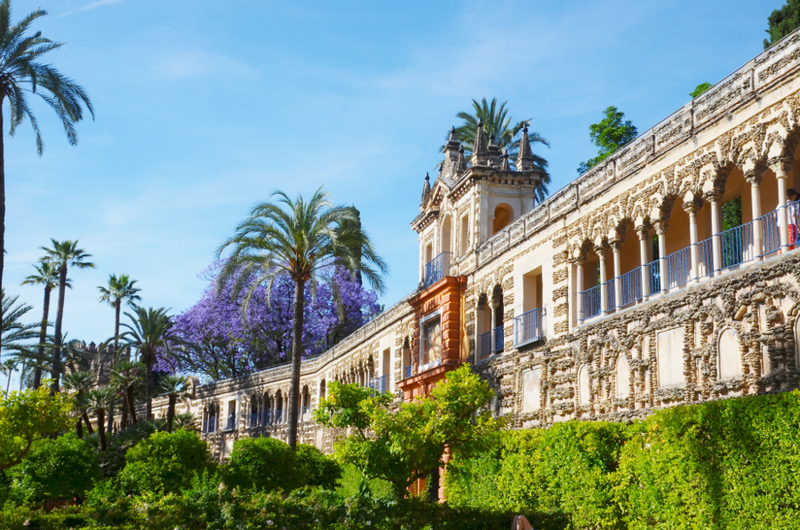 In Seville we can visit the old town, the Plaza de España (the Spanish square), the Archaeological Museum, the famous Giralda, the Reales Alcázares and the district of Triana. The old town of Seville is one of the largest in Europe. You can find here two main places of interest of the city: the Cathedral and the Royal Alcazar. Both the Royal Alcazar and the Cathedral are World Heritage Sites registered by UNESCO. Seville cathedral is built in Gothic style and is the third biggest cathedral in the world. The temple stands out not only for its dimensions, but is also famous for its bell tower known as the Giralda which is 104.1 meters high and was the tallest tower in Spain for many centuries. Both the Giralda and the Royal Alcazar represent the most important Arab legacy of the Andalusian capital. The impressive fortified palace known as Real Alcázar or “Reales Alcázares has been used to accommodate members of the Royal Spanish Family and other important personalities. However, it is not only the Royal House that represents the great beauty of the Royal Alcazar: in their gardens where you can find fountains and ponds there were shot scenes to the popular HBO series “Game of Thrones”. 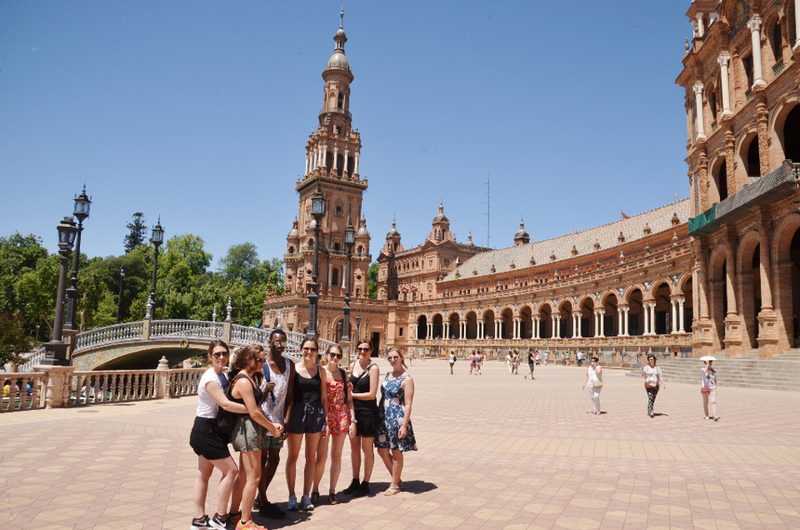 Plaza de España is among other most visited places in Seville as it is an example of the architecture typical for this region. This architectural complex has a half-circle shape that is to symbolize Spain embracing its former American territories. On the walls of Plaza de España you can find ceramic benches representing all the Spanish provinces in alphabetical order. The square is surrounded by a canal which is crossed by four bridges creating at the same time a pleasant and romantic atmosphere. 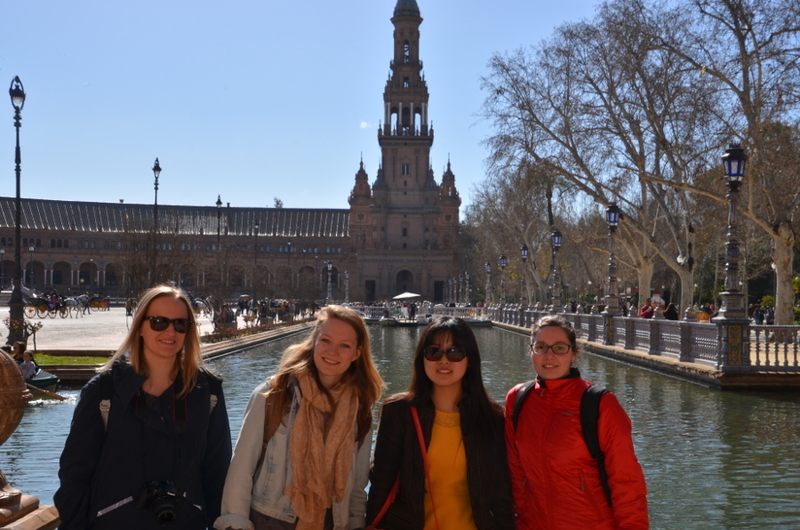 During the trip to Seville with Campus Idiomático, you can also visit the Triana neighborhood. Located on the other side of the old town, Triana is the centre of flamenco and bullfighters.